Some people find cooking therapeutic. Food helps us connect with each other across differences. Everybody eats. Truisms, aren’t they? But the most obvious things can be revolutionary in unexpected places. I realized that last month, when I went to jail. This March I travelled to Italy to meet people and collect stories for As Soup As Possible. One of them took me to jail. 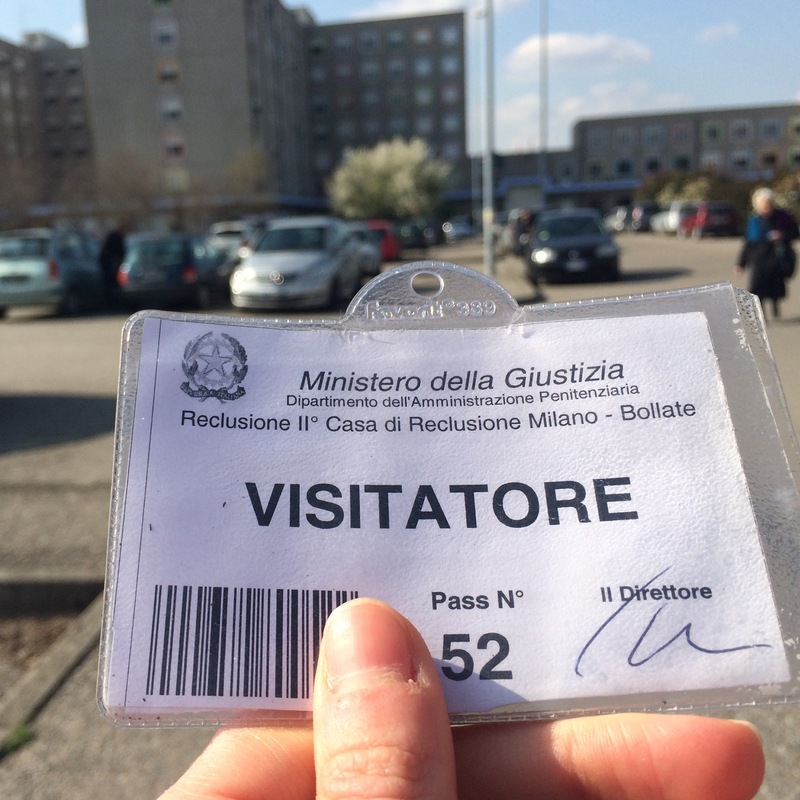 I visited the second penitentiary of Milano, a stone’s throw away from the premises of Expo 2015, to meet Silvia Polleri, a retired kindergarten teacher with a knack for cooking, who turned out to be one of the most badass persons I’ve ever met. Last fall she started a quality restaurant inside Bollate penitentiary, employing long-term inmates; now I rank among the many who have set foot in a prison for the fist time thanks to her bold initiative. Fictional jailhouses are more familiar to us than any actual penitentiary is. As a matter of fact, prison is something unthinkable to most people. I must confess it took me years after moving to Amsterdam to realize I had no idea where the jail and the cemetery were. Let me be blunt here, such places are the social equivalent of the city dump: everybody counts on it to some extent, most people don’t even want to smell it, nobody craves ending up there. Except prisons are not supposed to be end points. In a perfect world, they would be settings to new beginnings, as painful and challenging as they can get. That’s what prison officer Cabras suggested while we were waiting for Ms Polleri at the café inside Bollate prison. 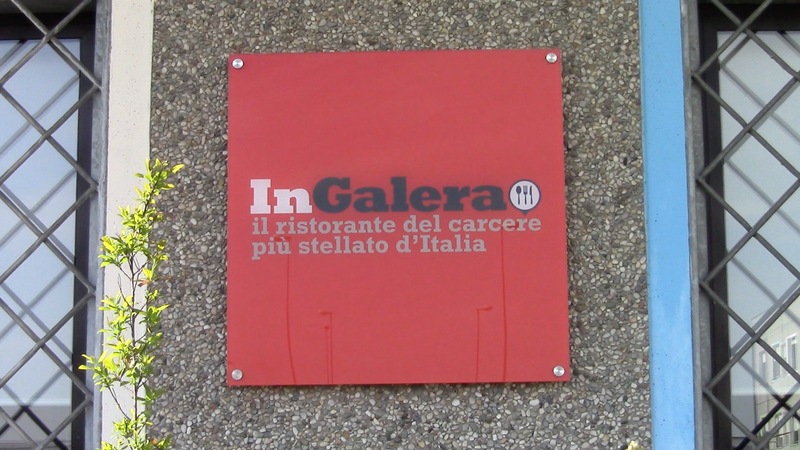 He approached me in front of the entrance to the restaurant, by the red sign with the self-explaining name InGalera [Italian for InJail]. I had checked-in with his colleagues at the front gate, where I had to leave my ID and declare my criminal record. I was early and officer Cabras was there by the restaurant to work with the team of inmates he leads, carrying out maintenance works around the penitentiary. He has been working in prison for over twenty-five years and seen people turn detention into the second chance it should be. Society can be extremely tough on people who have committed crimes – he explains, and social pressure can be as haunting as guilt and regret for someone who has made the wrong choices. Sometimes an efficient prison like Bollate can be a safe haven where troubled lives turn around and convicted offenders return as rehabilitated citizens to the outside world. Officer Cabras is a veteran here, he has seen young prisoners study hard to earn professional diplomas and qualifications, work to learn a job for the first time, find creative solutions to the many limitations incarceration poses. He wouldn’t trade his job for any other. In a complex country like Italy, difficult social issues like penal detention come with dramatic contradictions. The widespread overcrowding of its prisons, often resulting in living conditions close to inhuman and degrading, has cost Italy the official condemnation of the European Court of Human Rights. International covenants and the Italian constitution itself defend the dignity of inmates as inherent to all human beings, stating that the purpose of detention should be assisting prisoners to prepare for their release, with their future lives in mind since day one; however, reality can be tragically different. Exactly because of that, I believe we should value the many ways reality can be upliftingly different too. In difficult contexts like these, good practices are often based on the initiative of individuals with outstanding human and civil passion. Bollate penitentiary is regarded as a success model in Europe. Prisoners have single cells here, and they are allowed to walk around the detention area during the day, when cell doors are kept open. They are encouraged to take vocational trainings and helped to learn useful skills for their future return to the free world. Work is a pivotal element in this rehabilitation model, with many experimental projects active in both the male and female sections. Bollate makes the most of its geographical location in one of the strongest local economies in the country and encourages partnerships with local businesses. This provides inmates with opportunities to counterbalance the disadvantages of detention with a strong professional profile. This will help them find their new place in society once they are released and prevent them from recidivating in criminal activities just because they don’t know better. The prison hosts many different workshops, a horse grooming school, call centers and, since 2004, a catering company founded and managed by Silvia Polleri, who also promoted the instatement of a hospitality and catering school between these very walls. It hasn’t been a walk in the park for this retired teacher to deal with the institutional and human complexities linked to the penitentiary institution. 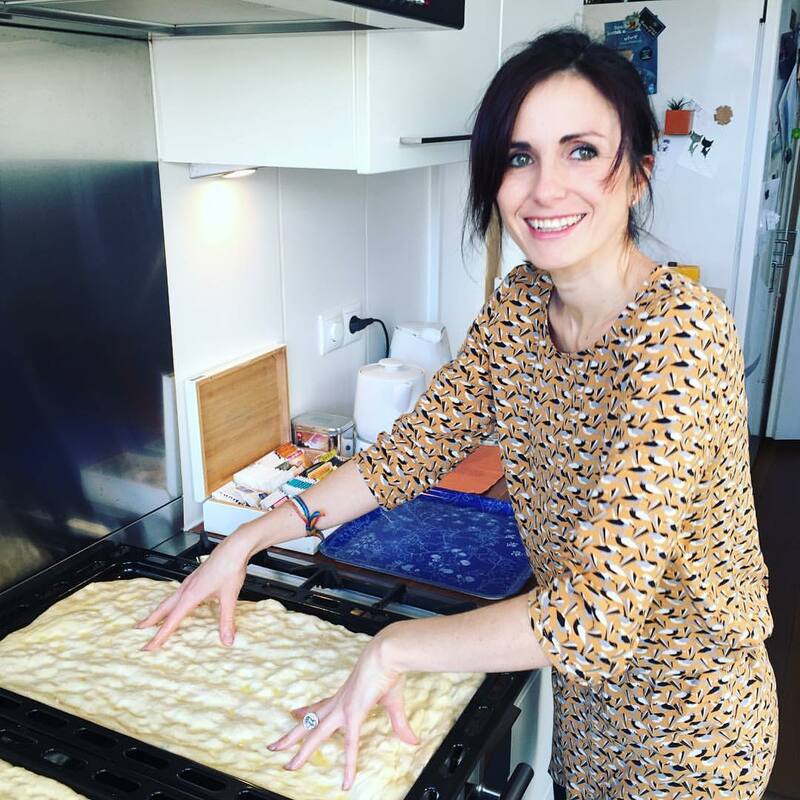 It took the support of enlightened directors, starting with Lucia Castellano, who first called her to the challenge, and above all it took determination, ambition and creativity, the qualities of a true entrepreneur. When the Ministry first refused to approve the initiation of a public hospitality school at Bollate, Polleri didn’t budge: she raised funds to start it privately for the first year and used results to convince the Ministry it was the right thing to do. She combines an unmistakable human touch with resolve, credibility and professionalism. The restaurant opened in October 2015 thanks to the contribution of sponsors from both profit and non-profit backgrounds and it encountered the favor of the public and the curiosity of both national and international media. This uniqueproject physically created a common ground for inmates and citizens from the outside to meet and communicate in the universal language of food and on a very professional level. Polleri is no charity lady, but a true leader to “her guys”, as she calls her team. She designed this project to become a successful business. Both the chef, Ivan Manzo, and the maître and floor manager Massimo Sestito, are free men and experienced professionals. They proudly lead their teams, in the kitchen and on the floor, and especially praise them for their unmatched drive and motivation. The quality is looked after very carefully, and the employees, from the kitchen to the floor, take pride in what they do. This reflects in the reactions of guests, who are amazed at what they see and delighted at what they eat. Unexpectedly, InGalera’s unusual setting makes it good material for pranks. Polleri found out some customers have been taking their friends here to blind dinners, just to see their faces turn dark in front of the high gates guarded by prison officers. She and her team are smart enough to play along, though; after all, InGalera has a clever wit of its own, that goes far beyond the naming. When I asked her where the restrooms were, Polleri enthusiastically escorted me to the ladies’, looked upon by Steve McQueen from the poster of one of the most iconic escape movies ever, 1973 Papillon. She laughs as she explains it’s her favorite piece of decoration and she proudly dedicated it to her female guests. 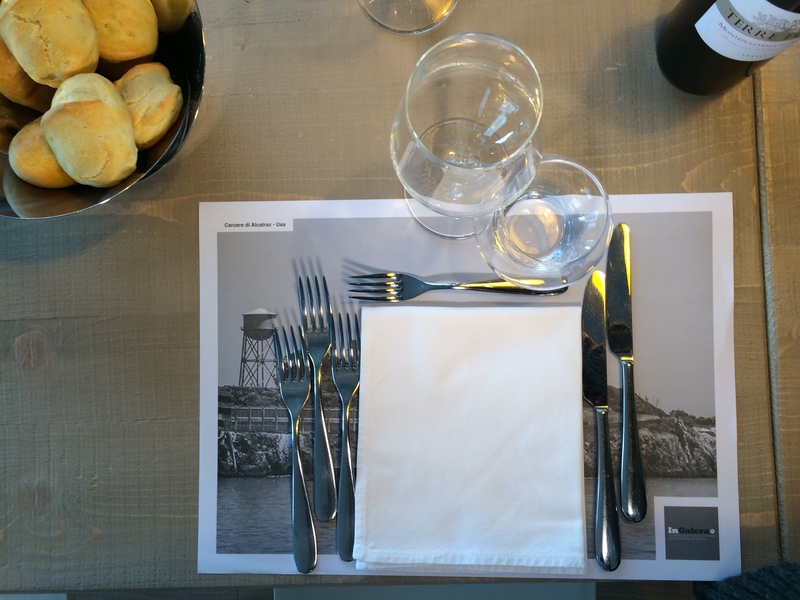 The whole restaurant is decorated with posters from classic prison movies; at noon the tables are set on paper placemats printed with b/w photos of famous jails from all over the world. The results are not a joke, though. Thanks to its progressive approach and its concrete investment in the human and professional potential of its inmates, Bollate has an impressively low recidivism rate: about 20%, against 68% on the whole Italian territory. This means that – thanks to the time spent on work and education projects – people are less likely to relapse into criminal behaviours, by almost 50%. Now the only good reason for them to come back to Bollate will be to eat a fancy dinner, InGalera. Next PostCoffee and Cake (from Jail with Taste).